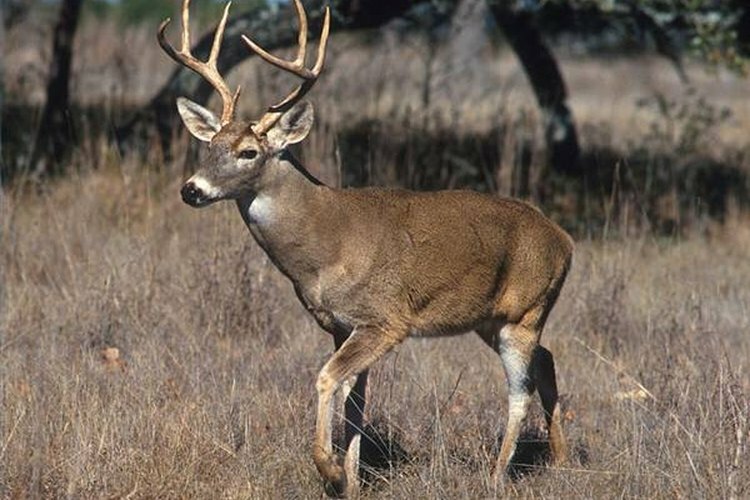 There are several types of guns on the market that are made specifically for hunting deer. These guns range from shotguns to high-velocity rifles, and each has been proved effective by generations of hunters. Rifles come in two basic styles: long-range and stalker. The long-range variety, such as the 30.06 or the 30-30, are capable of taking down a deer hundreds of yards away and drive the bullet home with pinpoint accuracy. These weapons are capable of firing on target even with small twigs or leaves in the way without throwing the bullet off. Stalker rifles, such as the .243 or the 7mm, are lighter and easier to carry over rough terrain. They are capable of taking down deer at 150 yards, but require a clear shot as the bullets easily change direction if striking a twig or leaves. Shotguns are designed for shorter ranges and brush hunting. Those looking to take a shot on a deer that is 75 yards away or closer can use rifled slugs. These can be used in a variety of shotguns, but are typically found in 10-, 12- and 16-gauge guns. Another option usually used for brush hunting or those stalking through dense forest is buckshot, which fires out large balls in a dense pattern. These are rarely accurate over 25 or 30 yards. Handgun hunting for deer usually requires a pistol that is capable of firing a .357 round or larger for the tactical purpose of being able to kill the animal. Rounds smaller than that will likely only wound the animal. Handguns with appropriate cartridges are capable of taking down deer from 75 yards away, though many are used in tighter, dense hunting situations that usually need shots of 25 to 50 yards. Muzzleloaders are black-powder guns that are capable of shooting long distances. Unlike rifles, shotguns and handguns, where the cartridges are loaded and sealed for you, the muzzleloader requires the hunter to put the powder and the shot into the barrel and put a firing cap under the hammer to shoot. The more modern the load, such as a rifled shot, the more accurate the muzzleloader will be. Round shot is not as accurate as modern load and is recommended for use under 100 yards. There are several variations for each type of gun. Rifles can be semi-automatic, fully automatic, bolt action, lever action and single shot, among others. Shotguns, handguns and muzzleloaders each come in a variety as well. The best way to choose a gun for deer hunting is to find a gun dealer with a shooting range and try a variety of weapons. Each hunter has his own preferred style of gun and finding the one that works best for you will make you more confident and capable when entering the woods. Sam Eggleston has been a journalist since 1999, working primarily with Gannett, Ogden and Morris newspaper companies. He has written for the "Escanaba Daily Press," "The Marquette Mining Journal," the "Kenai Peninsula Clarion," the "Novi News," the "Northville Record," the "Livingston County Press" and "Argus." Eggleston studied English at Northern Michigan University.